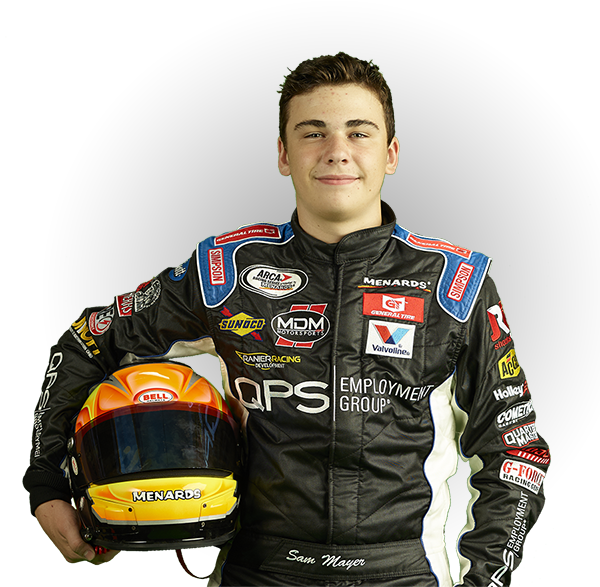 NEWTON, Iowa, July 6, 2018	(Newswire.com) – Franklin, Wisconsin racer Sam Mayer, 15, will make his debut in the ARCA Racing Series this Saturday night when he straps into the QPS Employment Group #40 Toyota with MDM Motorsports for the Fans With Benefits 150, which will be televised live on MAVtv beginning at 8 pm Central time. MDM Motorsports has entered five ARCA Racing Series teams for the event, including the top two racers in series points (Sheldon Creed and Zane Smith), Harrison Burton (son of former NASCAR star turned NBC Sports analyst Jeff Burton) and rising mid-south racer Chase Purdy. Smith has three wins, Creed has two and Burton has been to victory lane once already this season for the team, so Mayer will have plenty of success and knowledge to draw from in his quest to race to the front on Saturday. Mayer became the youngest driver to ever win a NASCAR Whelen All-American Series late model race at Greenville-Pickens Speedway in 2017. He also added two more late model wins and a total of 13 top ten finishes last year, along with championships in two U.S. Legends Car series at Charlotte Motor Speedway. Crew chief Robert Huffman will be calling the shots for the second generation racer, who is a Ranier Racing Development driver under the mentorship of driver development expert Lorin Ranier. Mayer is currently scheduled to compete in two ARCA Racing Series events this season along with selected starts in the NASCAR K&N Pro Series East and West with MDM Motorsports and Jefferson Pitts Racing. Mayer also pilots the #9 Menards Late Model for Jr. Motorsports in the CARS Tour while continuing to race his Legend car, having already picked up a pair of wins in this year’s Bojangles Summer Shootout Series at Charlotte Motor Speedway in North Carolina. He started this season by competing in the ultra-competitive World Series of Asphalt Stock Car Racing at New Smyrna Speedway in a super late model stock car, and finished second in series’ points, beating out some of the top racers in the nation.